Egg salad is the perfect dish to make when you’ve got leftover hard boiled eggs from Easter weekend, and it tastes amazing when you replace some of the mayonnaise with our Garlic Gold® Nuggets in Oil! We add celery for crunch, and a big handful of parsley for its springy, herbal flavor. You can also use chives, tarragon, basil, or any other mild, leafy herbs of your choice. 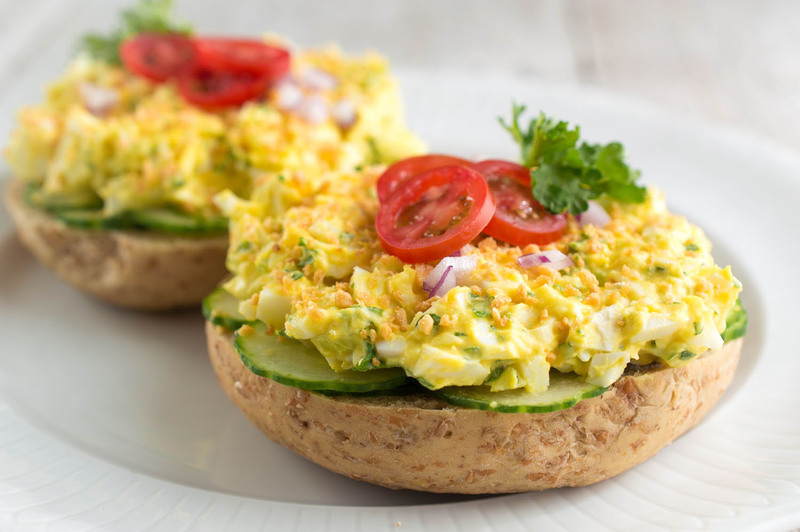 Serve the egg salad like we did, on sprouted wheat bagels with sliced vegetables for a hearty, healthy lunch. Or, go the snacky route and scoop it onto crackers, endive leaves, or celery sticks. Egg salad is the perfect dish to make when you’ve got leftover hard boiled eggs from Easter weekend, and it tastes amazing when you replace some of the mayonnaise with our Garlic Gold® Nuggets in Oil! We add celery for crunch, and a big handful of parsley for its springy, herbal flavor. You can also use chives, tarragon, basil, or any other mild, leafy herbs of your choice. Serve the egg salad like we did, on sprouted wheat bagels with sliced vegetables for a hearty, healthy lunch. Or, go the snacky route and scoop it onto crackers, endive leaves, or celery sticks. In a medium mixing bowl, combine the chopped eggs with the rest of the ingredients and stir until well mixed. Serve as an open-faced sandwich as shown here, or on crackers or endive leaves as an appetizer or snack. 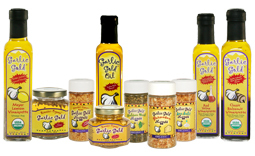 Top the egg salad with Garlic Gold® Nuggets just before serving for added crunch. Love the photo! It brings the recipe to life! Alternatively, for Living Foodists, firm tofu seasoned with a Pitta seasoning blend can substitute for the egg. I’m making your recipe in the morning! Thank you. This was great and so glad I get your newsletter. Thanks for the helpful healthy recipe that really dressed up a classic AND it was easy on the budget. 🙂 This is going to be a keeper!